The term “Renaissance man” gets tossed around a lot these days, though few fit the bill quite as well as Milwaukee’s Bob Uecker. Like the de facto Renaissance man himself, Leonardo da Vinci, Uecker is man of many talents and a master of countless crafts. Unlike the Italian genius, however, Uecker never painted The Last Supper or the Mona Lisa, though he was once nearly choked to death by wrestling superstar Andre the Giant. In honor of Uecker’s 40th year as the voice of your Milwaukee Brewers, as well as his 55th year in professional baseball, The A.V. Club looks back on a brilliant, multifaceted career that’s seen a once lowly major league catcher slowly transform into a beloved national treasure. From Mr. Belvedere to Major League, published author to WrestleMania announcer, Uecker’s many lives perfectly exemplify the ideals of the modern Renaissance man. Fire up the Usinger’s and start slamming the Robinade! Following his less than distinguished stint in the majors, Uecker entered the world of broadcasting. In 1971, he made his debut as the play-by-play radio announcer for the Milwaukee Brewers, a position he still holds to this day. His dry wit and dubious taste in checkered sports jackets also made him a favorite on the talk show circuit—Uecker would end up making nearly 100 appearances on Johnny Carson’s Tonight Show. In 1982, he flexed his literary chops by releasing a pun-filled and truth-stretching autobiography, A Catcher In The Wry. Between his TV gigs and high literary aspirations, Uecker also found time to shill for Miller Lite, host Saturday Night Live, and star in 1985’s direct-to-video gem, Bob Uecker’s Wacky World of Sports. More than any other period, the ’80s represented Bob Uecker in his prime: bronzed, quick-witted, and slightly intoxicated. In 1985, Ueck would land the plum role of patriarch George Owens on TV’s Mr. Belvedere. The sitcom not only bolstered Uecker’s fame, but would go on to define him as anathema to snooty English butlers everywhere. A few years later, he would serve as guest announcer for both WrestleMania III and IV, calling matches and trading quips with such noted thespians as Gorilla Monsoon and Bobby “The Brain” Heenan. 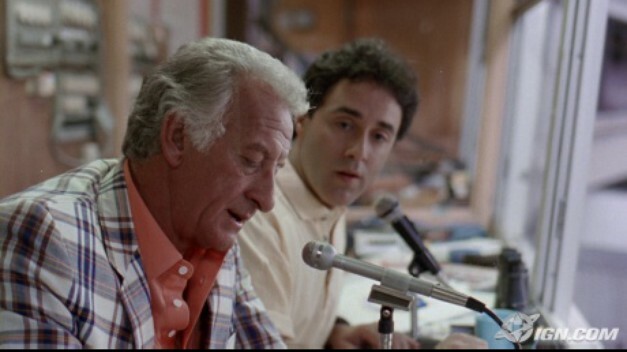 Hollywood came calling in 1989, when Uecker co-starred in the endlessly quotable Major League. Ever the trooper, he would also go on to reprise his role as announcer Harry Doyle in the film’s two sequels: Major League II, and the little seen, Scott Bakula-helmed Major League III: Back to the Minors. Uecker entered the 21st century in high style: by winning a bunch of awards and filing a restraining order. He was inducted into the Radio Hall of Fame in 2001, and received the Baseball Hall of Fame’s Ford C. Frick Award in 2003. Three years later, the 71-year-old Uecker won a restraining order against an obsessed, middle-aged female fan—a woman whose not-at-all-crazy website goes to great lengths to explain just how not-crazy she really is. Undeterred by his crazed stalker, Uecker was inducted into the WWE Hall of Fame just last month. Not only is this latest honor completely awesome—you don’t see Harry Caray in the WWE Hall of Fame, do you?—it represents the perfect topper to a strange, sometimes brilliant, sometimes ridiculous 55-year career. In your face, da Vinci.